As tattoos become more widely visible on social media, television and in the community, the artists responsible for those tattoos may not receive the same exposure as not many know much about the artist behind the tattoo. 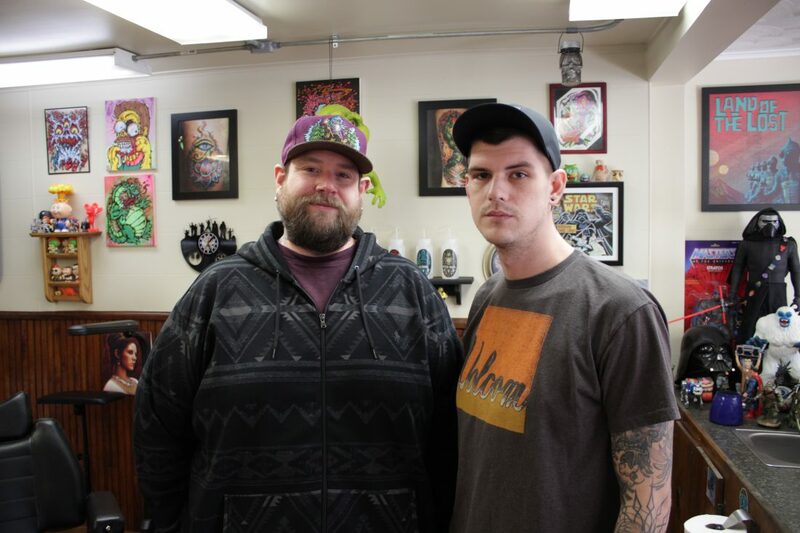 Aaron Bellve, of Totem Tattoo, and Scott Bowen and Jordan Mortimer, of Far Beyond Driven Tattoos, have been bringing art to the skin of locals for years. Most people coming to get tattoos or passing by a shop only see the artists for a short time, but much more goes into being a tattoo artist than just doing tattoos. A large amount of preparation and drawing goes on behind the scenes in both Totem Tattoo and Far Beyond Driven Tattoo. For Bowen and Mortimer, their love of tattooing revolves around their desire to create art and make people happy, they said. Whereas Bellve enjoys taking people’s sometimes unrealized ideas and pieces of what they want and creating a cohesive piece that the customer can appreciate and carry close to them forever, he said. Bellve’s days are fueled by coffee as he gets his equipment, supplies and reference materials around before and between appointments. “From the outside, it may seem very hurried, but I take my time with each piece and often stay late, making certain each tattoo is not just right, but right for that client,” Bellve said. At Far Beyond Driven, Bowen and Mortimer work on iPads and traditional transfer paper. With the iPads, the artists can work in multiple layers and can show clients what their finished piece will look like, Bowen said. Mortimer’s drawings on transfer paper can be seen hanging up within the tattoo studio. Tattooing, however, isn’t these artists’ only medium. Mortimer is getting into painting, Bowen paints and works on comic books and Bellve calls his wife while he’s drawing. “Whenever there is a means of making a mark within reach,” Bellve said, he’s drawing. This constant positive creation, however, is often undercut by the lingering stigma of and misconceptions about tattooing and people with tattoos. The perception of tattoos is getting better, as it becomes more prevalent throughout the community, especially on professionals, Mortimer said. “Everyone thought it was just sailors and criminals getting tattoos,” Bowen said, whose clientele includes police officers. “My doctor has tattoos,” Mortimer added. “I’ve had people in my chair express absolute shock to find that I’m capable of intelligent conversation or that I’m not spiritually void,” Bellve said. Bellve has been tattooing for 18 years and fell in love with the tattoos that would have fallen short had it been made on canvas, paper or been without their original context, he said. Because tattoos stay with the person, they never lose context. “I was enamored with this very blatant and widely disparaged commitment to the images … work that couldn’t exist outside of tattooing,” Bellve said. His first tattoo “was a star on my arm. It was the ’90s,” Bellve said. He also tattooed a swallow on his ankle as “it was a bit of a tradition to do your first tattoo on yourself,” he added. Similarly, Mortimer’s first tattoo was a self-done rooster on his leg, he said. He grew up around people with tattoos, which got him into the practice himself. Mortimer has now been tattooing for almost five years. Since beginning, his friend’s Japanese-style tattoos have become Mortimer’s favorite style, he said. “I was always stoked how awesome (tattoos) looked, and I always wanted to be like that,” Mortimer said. The allure of tattoos for people is that they never really go away. Bowen’s first tattoo was a Spiderman, which he has since covered up but “you can still kind of a see a spider eye,” he said. “I went through all kinds of mediums and finally ended up with a tattoo machine in my hand, and just loved it,” Bowen said. When Bowen bought his first machine, his friend immediately wanted a flame outline tattoo right then and there, he said. He has now been tattooing for 16 years. Before getting a tattoo, though, research is essential, the three artists said. Every tattoo artist has their own way of going about their art, but your tattoo isn’t their tattoo. That is why tattoo artists meet with clients beforehand to make sure everything is as the client wants it. Even for walk-ins, the artist’s input is to solidify the client’s idea in a way the client will be happy with. “Get tattooed by people who guide you with their expertise but don’t bully you into their style,” Bellve said. “Don’t worry what other people say. Do it for yourself,” Bowen said.